Applications are now open for abstract presentations at BSAVA Congress 2017. Submit now and you could be integral part of this important section in the Congress programme. The Clinical Abstract can be on any veterinary subject, such as announcing the preliminary results of a new study, describing interesting cases or discussing new techniques - submissions from those in general practice are especially encouraged. 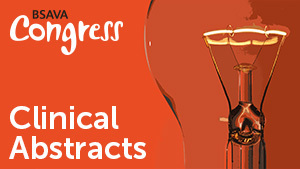 This year we are changing the submission format for clinical abstracts to be presented at Congress in 2017. We are bringing the format of abstract, for both oral and poster presentations, in line with that used in the Journal of Small Animal Practice (JSAP) in order to facilitate publication and to help readers identify the most important information quickly and easily. If you are thinking of applying to present an abstract, take a look at our 5 step guide, prepare your abstract using our template and submit before the closing deadline of 24th October.